Two Bears Farm and the Three Cubs: Pregnant with Twins, Part I. Pregnant with Twins, Part I. My mother had always warned me I might have twins. She would say in (to me) an ominous voice, "You're the generation marked for twins". I ignored her. This is a prime example of why you should not ignore your mother. She knows what she's talking about. So early December 2008 found me in a new doctor's office, interviewing him as a potential new ob/gyn. In truth, I was about 4 days pregnant at the time, but of course didn't know it. I had loved my previous ob/gyn, but the only other doctor I liked in the practice had left. Which left 3 alternate doctors that I did.not.like.one.bit. In fact, I disliked them so much that had they been on call when I went into labor, I might've just delivered at home. Okay, not really, but you get the point. So anyhow, there I was meeting with Dr. Harding. Who I liked. Because he was a runner. And could talk running jargon with me. Plus, he seemed laid back. When you're a neurotic like myself, a laid back doctor is definitely a good thing. He had come highly recommended by my friend, Annie, who had given birth naturally with him as her doctor. So, with a few reservations, I decided to switch. And shortly after making the decision, I got the positive pregnancy test. So I immediately ordered Pierce this shirt that had a penguin on the front and said, "I've got a Christmas surprise". On the back it said, "I'm going to be a big brother". Cute, huh? Then I called Dr. Harding's office and begged for an early ultrasound so that I could break the news to family over Christmas. They agreed. Gotta love a flexible practice! My appointment was right around 6 weeks. And the ultrasound tech wasted no time in telling me there were twins. She showed me both little black dots, with just the beginnings of a heartbeat each. One twin had a heartbeat so irregular, it couldn't be measured, because it was just getting started. Now, never, in my whole life, had I wanted twins. But the second I saw those two little black ultrasound dots, I wanted them more than I'd ever wanted anything I didn't know I wanted! Of course, there was a huge sense of denial about the whole thing too. I didn't think I'd really have twins. But all of the sudden, I definitely wanted to. When I called Paul to tell him we were having twins, he thought i was joking. He had his own sense of denial I think. And so, we settled in to see what would happen. At Christmas, Pierce proudly sported his new shirt. And no one noticed. FORTY-FIVE minutes passed and no one remarked on the shirt. And finally. My mom screeched! The message had been spotted! 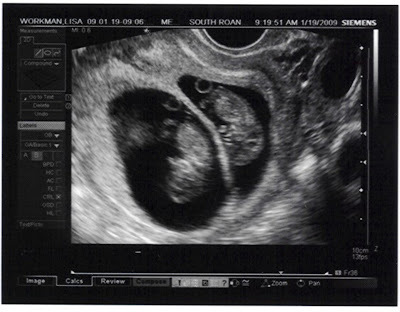 So we pulled out the ultrasound pic which the tech had kindly written "TWINS!" on to show around. My aunt and uncle arrived shortly after this, and they, too, did not notice the shirt. My dad kept saying, "Pierce, I like your shirt". It was fun, waiting to see how long it would take. 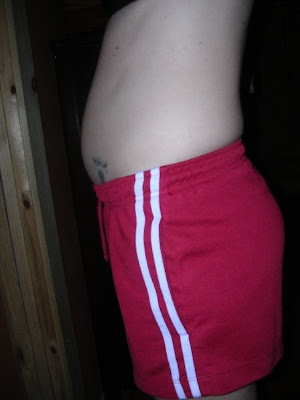 I started showing early, and was in maternity pants by week 9. In fact, during week 9 a coworker actually asked me if I was pregnant. I responded, "If I was, I wouldn't be ready to tell people yet" with a smile. This is the ultrasound pic of the boys from week 9 (note: you can click on this picture to view it in full size). So what a relief it was to be able to announce the news. And with the let up of the morning sickness, I didn't feel bad, other than a general dislike for the state of pregnancy and a significant slowing down of my running. It was extremely hard to hide the pregnancy from my running friends, because I struggled so much to keep up with them (not to mention the inability to run more than 3 miles without a bathroom stop). And so, with the end of the first trimester, I started to accept that I really was going to be birthing twins. With acceptance, came new worries of premature labor, lots of googling, and a huge sense of anxiety over the c-section rate for twins. So began my search for what, if anything, I could do to avoid a c-section and unnecessary intervention during labor. 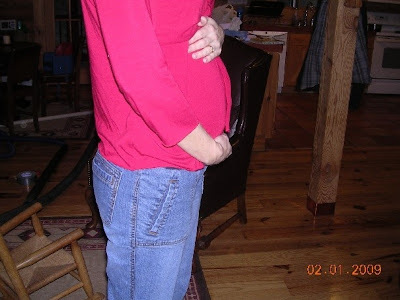 Click HERE to read about the second trimester. I like the part where you say your mother knows what she's talking about.